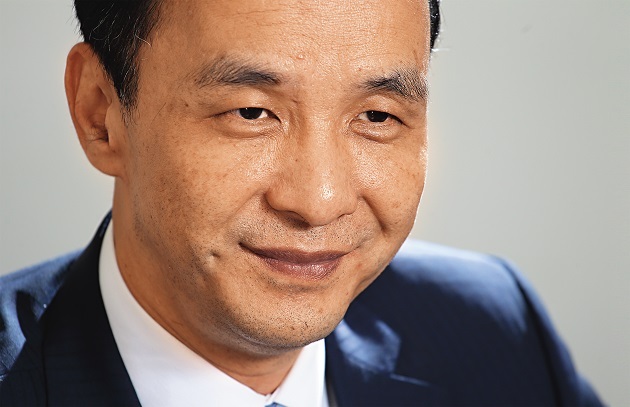 Kuomintang (KMT) presidential candidate Eric Chu has had a stellar political career. Yet in the upcoming presidential elections, he is predicted to lose to DPP challenger Tsai Ing-wen. Critics say Chu over-thought his strategy and threw his hat in the ring when it was too late. Eric Chu's (朱立倫) light-colored attire highlights his figure amid the crowd of supporters dressed in somber winter clothes. He steps onto the stage with big, confident strides as the audience, some 100 civil servants, shout a thundering chorus of "Chairman Chu for president, KMT go, go, go,” their hands in the air. In his affable and cultivated manner, Chu beams a dimpled smile to the audience. Yet as soon as Chu takes the microphone he fires off a barrage of criticism at his main rival Tsai Ing-wen (蔡英文). Chu has yet to see defeat at the polls. He has won five elections for political office, successively serving as legislator, Taoyuan County magistrate and New Taipei City mayor. "Certain political figures have smeared the reputation of our civil servants for a long time, causing social confrontation and undermining civil service morale," he says, lashing out against Tsai. On the other hand, he does not skimp on morale-boosting remarks directed at his audience. "The most important thing is giving serious consideration to the principle of the protection of trust, which is the contract that the government and civil servants signed at the time (guaranteeing a certain level of pension benefits),” he declares, eliciting applause and cheers. Chu captivates his audience, not mincing words when it comes to criticizing the opposing camp. Given Chu's aggressive cross-examination of Tsai during the recent televised debate between the three presidential candidates, this is no surprise. The Democratic Progressive Party (DPP) camp, which has observed Chu over many years, describes him as a "talented performer” who "delivers a convincing act as politician yet fails to spark enthusiasm in others.” Even KMT Secretary-General Lee Shu-chuan (李四川) feels that Chu has ample self-confidence but lacks cordiality. "Somehow he is not approachable enough,” Lee says. Chu's father-in-law, KMT heavyweight and former Taiwan Provincial Assembly speaker Kao Yu-jen (高育仁) , who single-handedly launched Chu's political career, recalls that, as a student, Chu was always top of his class in exams from elementary school all the way through university. He was well-behaved, diligent and played by the rules. The problem, says Kao, is that "politics is a jungle without rules. How can you talk about rules once you have jumped into the fray?” he asks. Having spent his entire life on the political stage, Kao is fully aware of the treacherous and murky sides of politics. After obtaining a Ph.D. in accounting from New York University, Chu returned to Taiwan in 1992 to teach at National Taiwan University. Two years after becoming a tenured professor in 1997, he successfully ran for legislator. 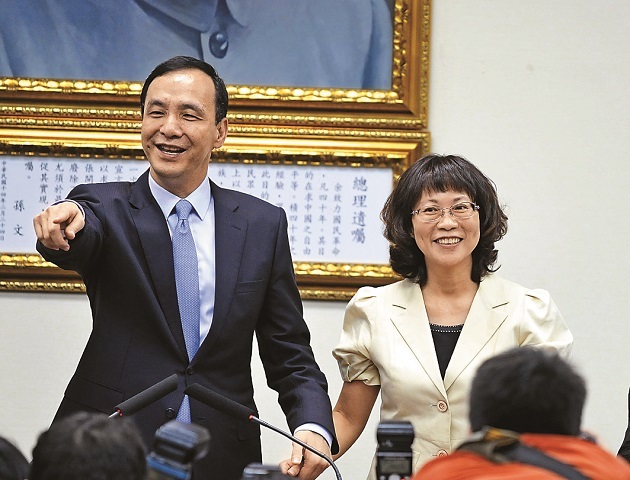 Subsequently, he was twice elected Taoyuan County Magistrate, and defeated Tsai, widely considered a strong contender, in the New Taipei City mayoral elections in 2010 with a wide margin of 110,000 votes. Though he only narrowly won reelection in 2014, Chu has never lost an election. In contrast, Tsai has had to overcome severe election setbacks. She lost against Chu in the New Taipei City mayoral election in 2010 and again against Ma Ying-jeou in the presidential elections in 2012. In the upcoming presidential elections, Chu is once again taking on Tsai, who struggled in the beginning to bounce back from her election defeat. Chu and Tsai have both served as vice premier, and both went into the presidential race as chairpersons of their respective political parties. Yet for Chu, the situation has turned 180 degrees. The latest national survey by CommonWealth Magazine shows that a relative majority, or 32.9 percent, of the respondents believes that Tsai has the ability to solve future problems, whereas 14.5 percent named Chu and 12.9 percent pointed to James Soong, presidential candidate for the People First Party (PFP). All opinion polls published during the presidential campaign so far indicate that Chu is fighting an uphill battle against Tsai. The KMT nominated Chu as the party's new presidential candidate to replace the unpopular Hung Hsiu-chu (洪秀柱) on October 17, less than 100 days before the January 16 elections. "If it was for me, I would not participate in this election,” noted Chu in an interview shortly after he proposed in a briefing at the KMT headquarters that companies raise wages for all employees in exchange for corporate tax cuts. "It is a difficult task, but when you have a responsibility you must shoulder it,” remarks Chu in explaining why he felt compelled to accept the presidential ticket. The factional divisions within the KMT and longstanding grudges among party heavyweights became a burden for Chu when he became the head of the party. Chu's close aide Wu Chao-ming (吳肇銘), director of the KMT's National Development Institute and a former chairman of the Research, Development and Evaluation Commission of the New Taipei City Government, believes the decision reflects Chu's character. "Some pitchers will continue to pitch balls even when they clearly know it will injure their hands. Nonetheless, they will grit their teeth and keep going until the end of the game in order to clinch victory for their team,” notes Wu in drawing an analogy between the presidential race and Chu's favorite sport baseball to illustrate Chu's competitive spirit. Even though Chu knows that he might not win the election, and although a defeat could put an end to his political career, he is still willing to run. 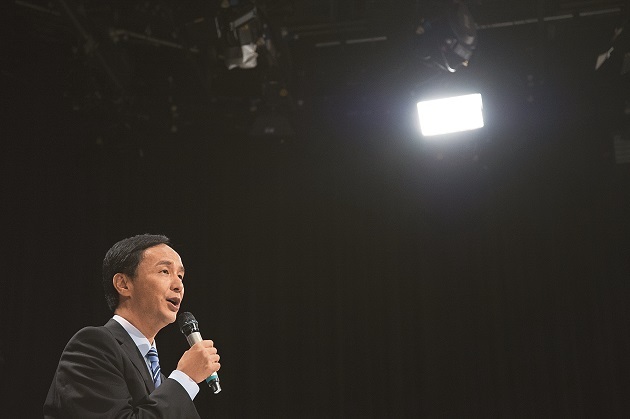 At election events, Chu often points to his achievements as Taoyuan County magistrate and New Taipei City mayor to illustrate his leadership qualities and power of execution. "I have served in local governments for a long time. We can replicate our good experiences in all of Taiwan,” Chu says, noting that he is closer to the pulse of local municipalities. At the same time, he does not forget to point out that Tsai has never held a local office. Chu not only presents himself as a problem solver; he also has his own personnel recruitment philosophy, putting expertise and professionalism above political considerations. "Chu's team is truly very strong,” admits DPP legislative candidate Lo Chih-cheng (羅致政), chairman of the DPP New Taipei City headquarters. 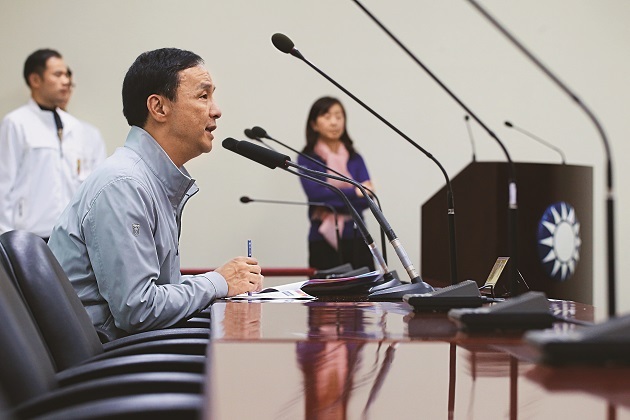 When Chu had just assumed office as New Taipei City mayor, he faced domestic security and water conservancy problems. He appointed Hou You-yi (侯友宜), who had risen to National Police Agency director under the previous DPP administration, as deputy mayor and Chen Shen-hsien (陳伸賢), a former Water Resources Agency director, as his secretary-general. Meanwhile, Hou has been promoted to acting mayor and Chen to deputy mayor. However, life began to get difficult for Chu when he took over as KMT chairman in January of 2015, following the party's debacle in the year-end local elections. He seemed to have lost his way in an unfamiliar forest, triggering doubts and criticism from both within and outside the party. After the KMT's unprecedented setback in the local elections in late 2014, then incumbent Chairman Ma Ying-jeou was forced to step down. Hopes were high among KMT supporters that the 54-year-old Chu, as the party's rising star, would be able to save and revive the KMT while at the same time eroding public support for Tsai's DPP. However, Chu failed to live up to expectations in many respects, with some party insiders openly stating that he didn't get a single job done after taking the helm of the party. Already he is being labeled "the weakest party chairman in a decade.” Although he took over the ruling party with a good track record from his stint as New Taipei City mayor, he nonetheless seemed unable to exert any substantive control over the Executive Yuan and the Legislative Yuan. 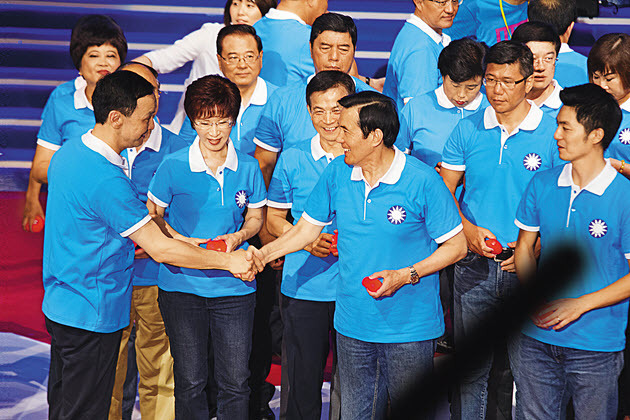 On top of those accusations, the overall environment did not favor the KMT as the party itself lacked cohesion. Most fatal, however, proved to be Chu's inability to make up his mind whether he should run for president. Since Taiwan's first democratic presidential elections in 1996, it has always been the KMT chairman who ran for president. "After he was elected party chairman and asked me to serve as secretary-general, I assumed he wanted to step forward to run for president,” recalls Lee Shu-chuan, who served as New Taipei City deputy mayor and Executive Yuan secretary-general before Chu recruited him as his right hand at party headquarters. Lee did not hesitate to place himself in harm's way by coming to Chu's aid, but little did he imagine that Chu would refuse to run on the grounds of uniting the party. During the many twists and turns in the KMT's nomination process – from Chu's backing Hung to eventually ousting her to run himself – "the KMT old guard kept lecturing him, saying you are the chairman, you need to take responsibility,” says Kao. After more than a dozen legislative candidates in northern Taiwan threatened to withdraw from the KMT should Hung uphold her candidacy, and even Ma interfered, Chu was forced to go back on his pledge that he wanted to do a good job as New Taipei City mayor and serve out his four-year term. With his back against the wall, Chu had no choice but to accept the nomination and join the presidential race. Chu, who prides himself on representing a new generation of KMT politicians, soon realized that he could not disregard certain historic liabilities. It became apparent that he was unprepared to deal with the longstanding grudges among the older generation that threaten to split the party. "I have to admit that I was wrong,” Chu says during our interview as he poses for the camera. "All along I thought that the rifts between the older KMT generation were not that severe, that I would be able to bridge them.”. He says that he misjudged the situation because the KMT's internal divisions are much worse than even he could have fathomed. 'Hung Out, Wang In' ? Not only did the local factions feud against each other, the old guard also fought its own skirmishes in defiance of party headquarters. One lawmaker who belongs to the Wang faction and maintains a close personal friendship with the Legislative Yuan speaker claims that Chu signaled to Wang before Hung's replacement that once Hung was out, Wang would come in. Wang reportedly was also prepared to enter the presidential race. "Chu probably faces some pressure that forced him to run himself,” the lawmaker says. Although the said pressure most likely came from the Presidential Office, the basis for mutual trust between Chu and Wang has already been damaged beyond repair. Chu's predicament - be it his inability to make up his mind whether or not to run, to withstand pressure from the old guard and other KMT heavyweights or to balance out rivaling forces within the party – shows that the KMT, this "grand old party steeped in history,” might be more than he can handle, and as a result, his status continues to wane. When picking his running mate, a crucial decision in an election campaign, Chu met yet another stumbling block. He personally invited lawyer Wang Ju-hsuan (王如玄) , a longtime advocate for women and underprivileged groups in society, to serve as his running mate. But when Wang, a former labor minister, subsequently came under fire for real estate speculation in connection with military housing estates, Chu was not able to control damage to the party. As the controversy escalated, even the once-loyal support base in the military descendants' villages, the traditional strongholds of the KMT, began to crumble. KMT Central Committee member Yao Chiang-lin (姚江臨) , who represents worker interests, mobilized workers for Lee Teng-hui in the 1996 presidential election campaign and witnessed grassroots enthusiasm first-hand in most of the elections since. "Even in 2000, when Lien Chan and Vincent Siew ran [for president and vice president], morale wasn't as low as it is now,” observes Yao, shaking his head. In the past, a phone call was enough to mobilize the labor groups. "Now you not only need to personally visit them, you also need to keep begging them,” Yao laments. "Chu's public support is too weak, and since he is not able to create momentum he cannot keep the factions at bay,” says Lee Hung-chun (李鴻鈞) , a lawmaker who has served four consecutive terms. "In contrast, the DPP's party list of legislators-at-large candidates presented by Tsai Ing-wen completely suppressed the party's old guard and swept out old thinking. She was able to do that because she is strong enough,” Lee says. The trends of the times create heroes. The corruption of Chen Shui-bian created the political star Ma Ying-jeou. Ma's lackluster performance opened the future for Tsai. From 2012 to 2014, worry, fake, and black were respectively voted Taiwan's word of the year. Asked to pick the Chinese character most representative of 2015, people opted for "change.” This reflects that the electorate's frustration has reached the point where people feel it is high time for change. As a result, the KMT has plunged into an unprecedented crisis. Picking human rights lawyer Wang Ju-hsuan (right) as his running mate damaged Chu’s campaign due to her alleged real estate speculation in connection with military descendant housing estates. After 66 years in Taiwan, the KMT is currently not only at risk of losing government control but also its absolute majority in the Legislature. Lee estimates that the KMT will win 50 seats at most. "This already includes the legislators-at-large,” he elaborates. That would leave the KMT several seats short of the 57 seats needed to control the Legislature. Chu himself is keenly aware of his predicament. He acknowledges that he is fighting an election campaign that "I know fully well is an impossible task.” But as always, he is doing his best by playing his aces, i.e. cross–strait and economic policy. In the national survey, more than 40 percent of the respondents cited the sluggish economy as Taiwan's biggest danger. Some 45 percent demanded that the government immediately take action to boost economic strength. Chu has proposed a "three bows, four arrows” economic policy for strengthening Taiwan's domestic supply chain and advocates further opening toward China. He believes that any kind of opening measures, be it toward ASEAN, China, Japan or the United States, will be reciprocated. For Chu, free trade agreements such as the Economic Cooperation Framework Agreement with China, the U.S.-led Trans-Pacific Partnership (TPP) or the Regional Comprehensive Economic Partnership (RCEP) initiative are musts for Taiwan. But he emphasizes that more has to be done to ensure that small and medium sized enterprises do not lose out. "You cannot directly calculate the cost benefits and then say the pros outweigh the cons just by comparing the figures,” he notes. As a local government leader, Chu says, he knows the importance of the power of execution and the ability to coordinate. Chu is also open-minded when it comes to ending the "political infighting” that emerged as Taiwan's second largest ill in the survey. "The international media often ask what will happen if the KMT loses power,” Chu says. He usually answers that the KMT will then be a rational, middle-of-the-road opposition party. If Taiwan wants to break the vicious cycle of political confrontation, the two major parties need to face problems, solve them and consult with each other to map out a feasible course for Taiwan. "No matter who is in power, we all must adjust our mindset. We must all emphasize consultations, be it the ruling or the opposition parties,” says Chu. He wants to end the vicious infighting among the political parties, which he believes causes the nation to undermine itself and to remain stuck in stagnation. Politics is in Chu's blood, as political involvement runs in the family. His father, a military officer, once served as National Assembly delegate and county assembly member for the KMT, while one of his mother's cousins is a DPP legislator. From childhood on, Chu was used to an extended family where the two political camps peacefully coexisted. However, many people probably do not know that Hsu Hsin-liang (許信良), a former Taoyuan County magistrate, can be credited for Chu's political awakening. Chu was a student at the prestigious Taipei Municipal Jianguo High School at the time. He rode an old bicycle around the county, enthusiastically following Hsu on the campaign trail to hear his rally speeches and help him canvass votes. Hsu had quit the KMT in 1977 to run for Taoyuan County magistrate as an independent. Chu was so inspired by Hsu's ideals that he could not help but praise him even when in school. After the eruption of the Zhongli Incident (中壢事件) – street protests by Hsu's supporters over suspected election fraud that turned violent – Chu wrote an article in the student paper that accused the government of provoking the protests. As a result, he was summoned to the student affairs office several times. No matter how the KMT fares in the elections, Chu will remain a key figure in the KMT. Chu met Kao's daughter and future wife Wan-chien (高婉倩) while studying in the United States. Kao not only introduced Chu into politics but has also stayed at his side as a mentor ever since. When Chu toyed with the idea of running for legislator, he went to see Kao to seek his opinion. Kao reflected for a long time and then told Chu that he could certainly give it a try, and that he would finance his election campaign. He resolutely backed Chu's legislative bid, paving the way for his future political career. Kao stayed involved throughout his son-in-law's political rise from his participation in the New Taipei City mayoral elections to the KMT chairmanship race and the presidential election. "That year , when he wanted to run for New Taipei City mayor, I told him if he wants to run for president, he should not seek reelection [as mayor], if he wants to seek a second term then he should not think about 2016,” recalls Kao. Eventually Chu told his father-in-law that party headquarters wanted him to seek reelection. As a result, he declared that he would do a good job if reelected and serve out his term. Kao mentions a print media commentary that said Chu would only be able to succeed if he was a rebel. As Kao, sitting comfortably on a sofa, recalls the article, he abruptly sits upright, saying, "A rebel does not respect boundaries and does not play by the rules, but is ready to use any means to achieve his goal. He (Chu) has been a model student from childhood on and has never taken risks in his entire life. It is impossible for him to oppose President Ma. If it takes a rebel to succeed then he won't be successful,” Kao says. Is Chu's political future already sealed? As long as the election results are not known, the verdict is not out yet. Chu has declared that he will step down as KMT chairman should his party lose the January 16 polls. "That's a responsible attitude, and also what I will insist on,” he says. No matter who serves as the next party leader, Chu hopes that his proposals and ideas will become KMT values.